"I am a rugby player. I am a soldier. I am an Officer. I am a brother. I am a role model. I am also gay." 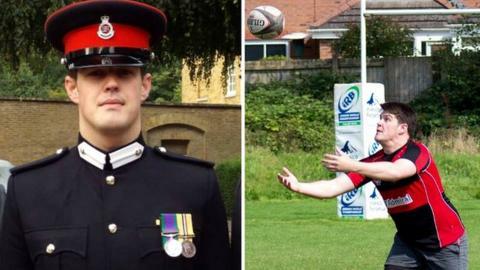 As part of Mental Health Awareness Week and International Day against Homophobia, former soldier and rugby player Richard Cann explains how sport helped him admit to his deepest secret. I've played rugby union since I was eight years old and over the years I've played for 10 or so different clubs. From starting mini's at Newquay Hornets and then returning after a two-year spell in Launceston (home of the Cornish All Blacks), my formative years were played in the heart of Cornish rugby following my heroes through the early nineties and the professionalisation of the great game. At 16 I left Cornwall and joined the British Army, starting a new chapter in my sporting career. I was lucky enough to be selected to play at a semi-professional level for the Army academy at under-21 level. As you can imagine work was quite busy and whilst away on tour I was lucky enough to have the opportunity to play for a civilian team in Northern Ireland. The above paints an almost idyllic picture of a young man's early life. It wasn't that easy. Bullied, I became a bully. All through my childhood, and well into my early twenties, I had kept up a façade that was to strain friendships and lead to me making decisions that have a sad irony in the cold light of day. Growing up isn't an easy process for anybody but rugby for me was a way of venting frustration, focusing energy on competing and proving myself on terms that I could understand - something that academia could not offer. It also gave me a sense of belonging, of almost safety when I was playing as part of a team. My early years of playing rugby also helped me to gain a sense of discipline and control that would later help shape the man I was to become in later life. After leaving the Regular Army in 2008, I am now an Army Reserve Officer in Cardiff where I play for and coach a civilian team as well as captain a military team. I have always been struck by the way rugby, and other sports in general, have the ability to view people on their merit or skill, and gathers people in camaraderie and passion regardless of skin colour, age, gender, disability, religious belief or sexual orientation. Sadly this not always the case, still we fight for justice, equality and inclusivity for all. I have a fairly large family with two brothers and a sister, each of whom are very individual people and all three have children - I have eight nieces and nephews. Recently I was taken aback by a comment that one of my brothers wrote on social media: "My brother, was and still is a huge influence on my life, on and off the rugby field." I am a rugby player. I am a soldier. I am an Officer. I am a brother. I am a role model. I am also gay. I believe the importance of understanding and accepting that people have multiple identities is crucial. Treating everyone with the respect that they deserve is only manners. Through sport, children are given the opportunity to better understand and interact with people and cultures that are different to their own, and through cultivating a safe environment for children and adults alike, we have the power to continue to shape the world for the better. Having the opportunity to play rugby in a gay-inclusive team whether in or out of the Armed Forces allows me to engage with people from my community, that understand the unique and sometimes added pressures involved with being gay in sport. Having a sympathetic ear, someone who knows what it is like and to talk to is incredibly important to someone's mental health and that is why I talk about my upbringing and the importance of rugby in my life. That is why I am proud to be part of the British Army and represent their LGBT forum. This year's Mental Health Awareness Week runs from May 14-20 and focuses on relationships and how strong social networks support and improve mental wellbeing. You can read more stories like Richard's all this week on Sport Wales' blog.